The overnight bus left Berlin at around 9pm and arrived in Gdańsk, Poland at 4:45am. It was one of those nights you think will never end. Ben and I pushed against one another on the sticky hot bus, trying to get some sleep. 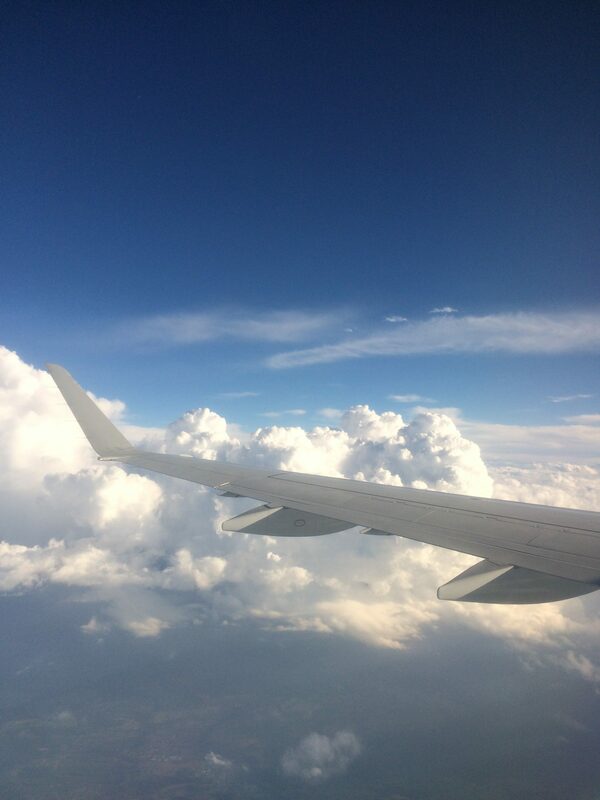 I spent way too much time lamenting my unwillingness to pay for a flight before I started doing breathing exercises and remembering that I had previously survived many other wild and crazy travel ideas, and yes, I would survive this one too. 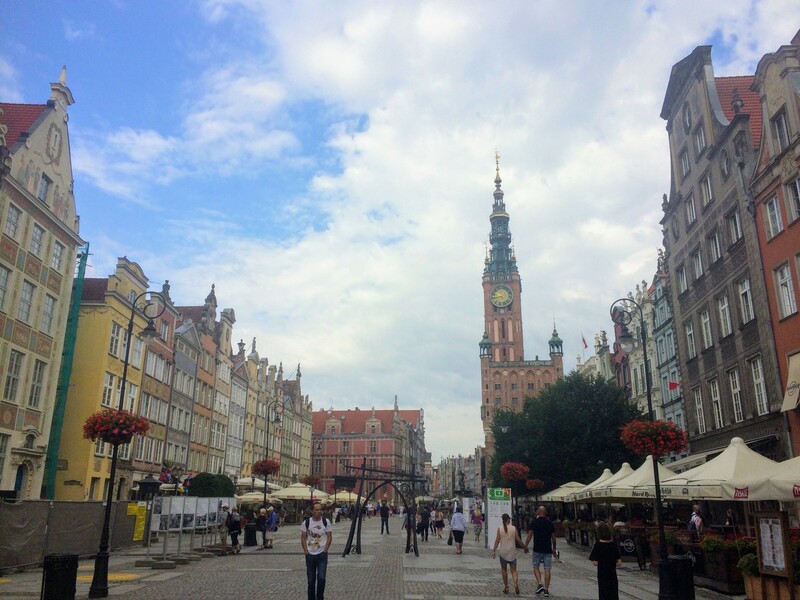 I woke Ben from a dead sleep when we pulled into the Gdańsk station and we stumbled off the bus and into a beautiful town we had never before seen. In fact , I’d never even heard of Gdańsk before Ben and I started planning our trip to Poland. But it’s position on the North Sea makes Gdańsk a popular summer destination, so it turns out that 5am is one of the most perfect times to wander around the city. We didn’t quite appreciate how wonderful it was to have it all to ourselves until later that day. But since we couldn’t check into our hostel until later and nothing much was open, we set out on a walking tour of the town. During 1938 and 1939 it is estimated that the lives of some 10,000 Jewish children were saved thanks to the organisers of what would come to be known as ‘Kindertransports’. These evacuations of children from Poland, Czechoslovakia, Germany, Austria and the Free City of Danzig to the United Kingdom saw children carried away from the Nazis by bus, train and ferry to new families in Britain. Four kindertransports managed to leave Gdansk/Danzig in the spring and summer of 1939 carrying a total of 124 children to safety. Sculptor Frank Meisler was one of them, and on May 6, 2009 his memorial to this exodus was unveiled outside Gdańsk Główny train station. From the monument and the train station, we wandered towards the Old Town and the harbor. We were grateful it was already bright outside this far north in July. It made the early hour after very little sleep much more bearable. It was a cloudy morning as we walked along, gazing in amazement at the colored buildings along the harbor and throughout the old town. Much like Amsterdam, the city of Gdańsk has these rows of buildings that are tall and thin, but so beautiful in their unique structure and color. The long center square of town has a gate at both ends, one that opens onto the harbor. In the square, we found billboards that explained that the city, which has a long history, like much of Poland, of being pulled back and forth between Russia and Germany. In fact it was almost completely destroyed in WWII. The billboards showed photos of the destruction and helped us appreciate the way the town has been so lovingly restored, a process that was not easy, especially during the Soviet era of Poland. I read some more about the different architecture choices after we got back and was intrigued to learn that they decided to remove all German street names and references. There are old ships along the harbor and a ferry that runs out to the North Sea. We sat across from the Old Town for a while and ate some bread we bought out of a kiosk in the train station. There’s an old black harbor crane that is no longer in use. We walked as far as we could up the side of the channel before turning around to find some coffee. It took us a minute to find the place that opened early (7:30ish). In general, I do not find that European cafés open very early, so we had to hunt to find this one. But we were glad when we did! We sat with our coffees for a long time, Ben using the café internet and me reading my guidebook. When we started moving again, we found that vendors were setting up all over town for a weekend market. There were stalls with new products, as well as antique stalls. Everything was super reasonable. And lots of fun things. These are the moments I am grateful for my crazy light packing because there is no question of being tempted to buy all the things. Of course, whenever we got to the food stalls, we wanted to try everything. But we’d just had breakfast so we came back to these later for lunch. Almost every stall had some version of this thick bread with some kind of homemade spread called Smalec that was stored in a large ceramic crock. 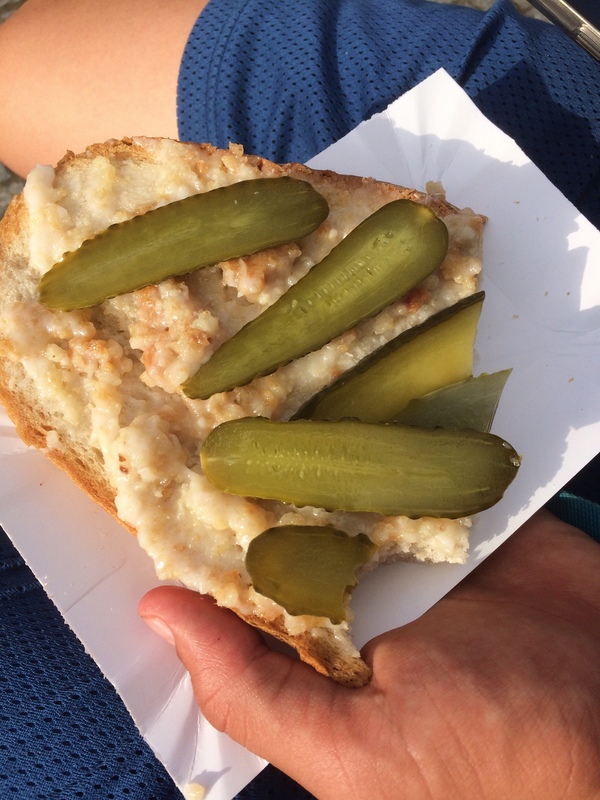 They were spreading it on slices of bread and topping it with pickles, also homemade. We bought a slice and split it and ate the whole thing while trying to guess what was in the spread. When we finally figured it out, we kind of wished we had opted for buying our bread plain, but this reminds me of why I absolutely love traveling with Ben. He is willing to try EVERYTHING. We joined a free walking tour of the city where we walked around and noticed details like these hanging chains for prisoners. We learned that the architect/designer of this armory included a detail to intentionally insult the city officials. We weren’t sure if this was a made up story. I’ll let you find seek out the insulting lion yourself. Gdańsk is famous for its locally brewed beers. In fact, when we mentioned that we were going there, we were most often told about the beer. Our tour included a walk down “Beer street.” The Polish word for beer is Piwo. Thankfully, our guide pointed out a couple of favorite pubs that served the best local brews, so we returned later to test them out. The sky had cleared up some by the afternoon so we decided to take a tram to the seaside. 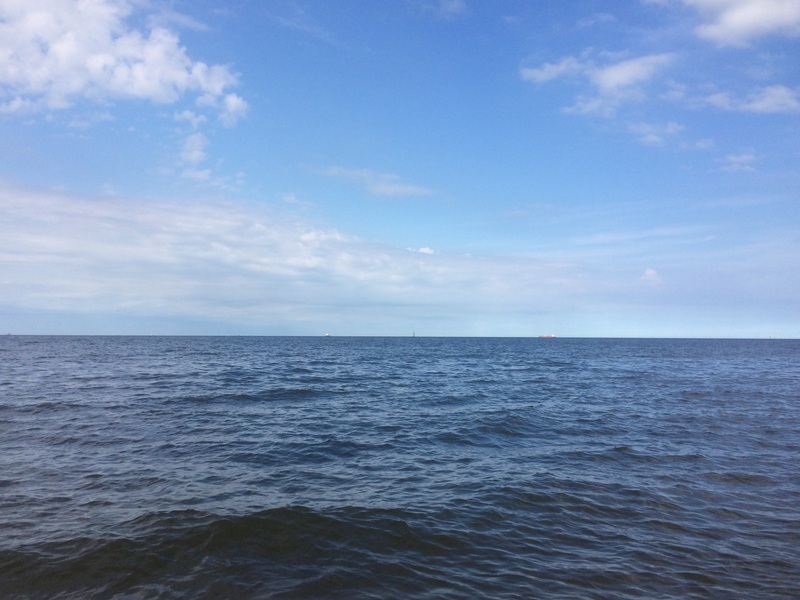 We felt like we were too close to the North Sea to not go and put our toes in it. It was fascinating to stand and think about how the water touching our toes was from the same body that splashes up on Aberdeen Beach, far away in Scotland and the same water that Mary Polly was near in Norway. It made the world seem smaller somehow. After a long walk on the beach, we found some ice cream. Then we took the tram back to town, found some dinner, and crashed early. We were hecka exhausted! I loved riding the tram in Gdańsk. All Soviet era trams are the same, so whenever I ride one, it takes me back to my student abroad days in Prague. Even the sounds and the smells are the same. The next morning we went to visit the European Solidarity Center, which commemorates and teaches about the peaceful struggle that began in Poland but spread throughout Europe to end communism in Eastern Europe. In Polish, it’s called Solidarność, and it began in the shipyard where the center is now housed. Out front is the Memorial to the fallen Shipyard Workers who were killed in December 1970 protests. The first three workers to die were shot down where the crosses now stand. It’s hard to tell how giant they are, but you can see them and the old shipyard cranes from all over the city. My favorite postcards from the city were from this place that featured these original drawings and many of them had these cranes and crosses on them. The entrance to the shipyard looks much the same as it did long ago, with a gate and kiosk for checking into work. It’s been preserved as the site of the shipyard workers’ strike where 17000 workers protested in 1980 for better working conditions and pay. The Solidarity Center is this incredibly beautiful building that has the feel of a ship in places and an indoor garden in others. Ben and I both got the audioguides and went through it at our own pace (mine slower of course). The audio included first hand accounts from folks who worked in the shipyard, and people who were part of the Solidarity Movement. It was incredibly fascinating and they used so many of the pieces of the story in the actual displays. At the end of the exhibition is this great wall of little tiny cards where visitors can write their own odes to solidarity. You add yours to the wall of solidarity, where the movement logo is displayed through the cards. The displays throughout the museum were creative like this, which made it fun + memorable to tour. Ben and I met back up here before heading back to town for a bite to eat before we caught our train to our next stop. However, we should not have eaten one thing on this day. Now we have learned the hard way. When you are going to visit Polish friends, be sure to arrive with an empty stomach! The real reason for our visit to Poland was so that Ben could see his friend Wiktor. Wiktor (pronounced Victor) and Ben were friends in Aberdeen at school, but Wiktor went home every summer to Nowe Dobra, a small town in Poland where his family is from, to spend time with his extended family. He has two sets of grandparents that live on farms that are very near to one another. Ben and Wiktor arranged our entire visit. I just booked a train there and a hotel and hoped everything else would work out. I had never met Wiktor’s family before. I was really just going completely on Ben’s enthusiasm for seeing his friend and getting to visit the country that so many of his Aberdeen schoolmates called home. Ben was so excited. I know he looks kind of stoic in the photos, but he honestly soaked up every minute of our visit with delight. Wiktor and his mom met us at the station and we were all immediately like extended family. We drove straight to a restaurant where we had a beautiful lunch with several aunts, uncles and cousins. Even a sweet baby. 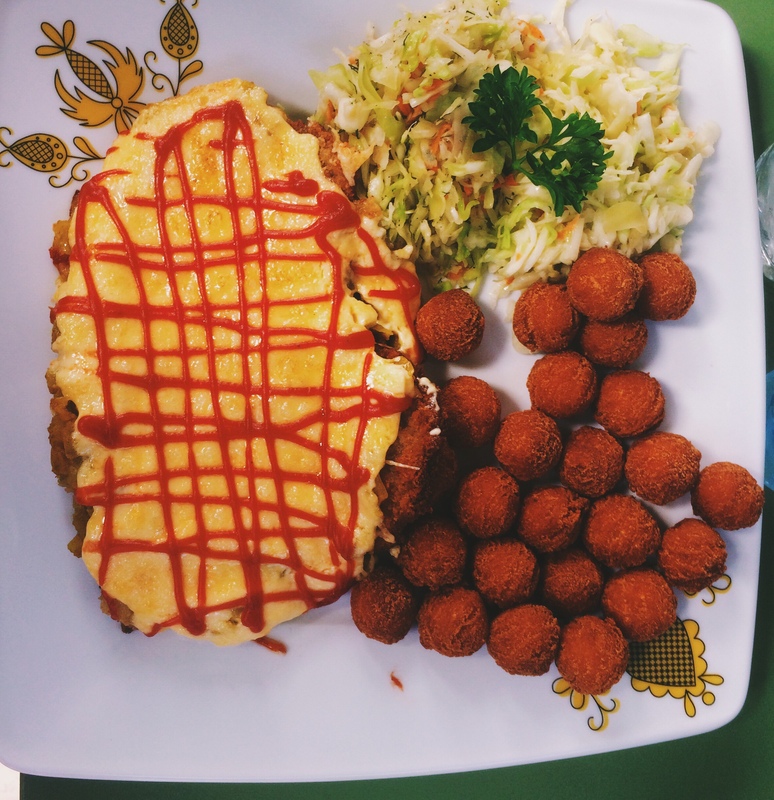 Everyone ordered this special dish that was like chicken fried steak covered in cheese, along with small potato dumplings and slaw. It was super yummy. And it began our nonstop eating and drinking for the next two days. Thankfully we also did a bit of walking as we toured the town of Chełmno, where both of Wiktor’s parents attended school. Also in Chełmno is the church were they were married. We climbed the tower to the top for the beautiful views of the town and surrounding farmland. We loved the red-roofed buildings. Below, the giant city hall seemed to have grown small. I never get tired of climbing church towers for the view from above. There are loads of churches in Chełmno actually, so we toured a few more. And we walked through the gardens. It was a hot day, so we stopped for a drink before going back to the family home. Next we got to visit all the grandparents, aunts, uncles and cousins. Ben and Wiktor helped carry all the drinks that were needed to feed such a crowd. Again, we never stopped eating. At one point a truck came to one of the houses to deliver pastries and bread in person. We were constantly offered ice cream and drinks. Cakes and pastries. We had homemade pickles that were pulled from a giant jar where Wiktor’s grandfather keeps them. His daughters showed me his cellar where he has put up more pickles that anyone could ever eat. Behind it he keeps a garden where he has grown tomatoes since his children were young. Now his youngest son runs the farm, which is the tradition in Poland. We tagged along when it was time to milk the cows at one of the farms and I was amazed when Wiktor’s grandmother jumped up in the truck to shovel out the hay. We all got to have the milk fresh from the cows! And we even got to help feed some of the babies. The boys helped Wiktor’s dad check and mend the fence around where the cows get to graze. I had a twinge of sadness for a minute for how rare it is these days that kids have the experience of visiting grandparents on the farm. It seems like that used to be such a common occurrence. My great-grandparents were farmers, and my grandparents had land and a huge garden, but none of my kids have farming grandparents. We have some adopted grandparents with farms though. I feel like there’s nothing quite like getting to touch the land (and animals) that feed you. Although, I kind of snapped out of my reverie when I realized how much physical work it is to be on a farm. Goodness gracious. 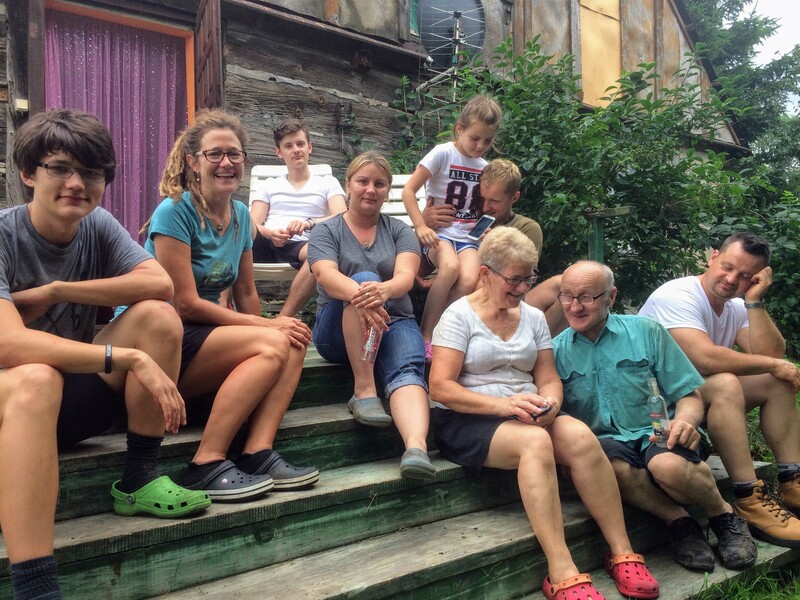 Wiktor’s family stays in their old farmhouse when they go in the summer, and after the cows were milked and fed, we were all sitting around on the front porch chatting and enjoying drinks (of course). In these family pictures, which are just a few of the many kind family members we met, I love how you can catch the sweet tenderness between Wiktor’s grandparents. I know Wiktor and his family would like to live all year in Poland and not just in the summertime, but both his parents have found better opportunities for work in the UK. So for now Nowe Dobra remains their summer home. 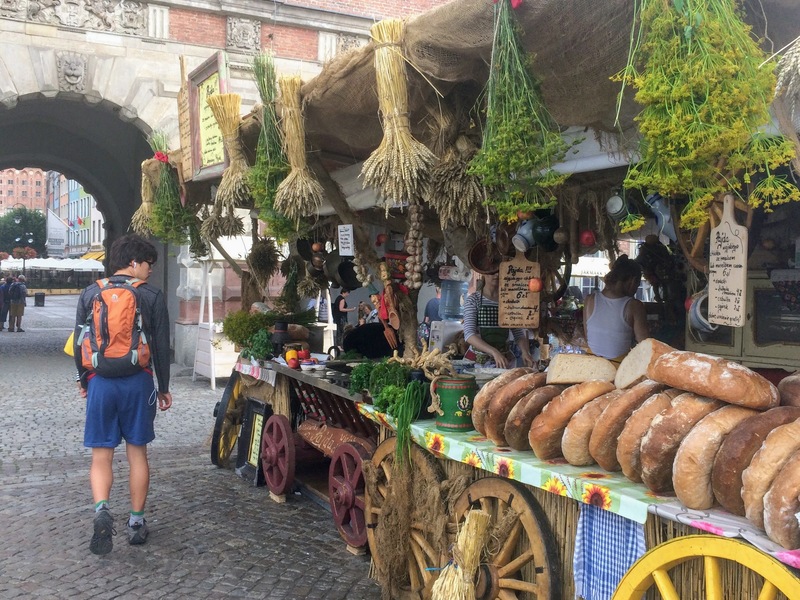 We asked them if they liked going to Gdańsk, as they always fly in there from Aberdeen and we had thought it was such a fun city, but they were all unanimous in their choice of favorite place, not just in Poland, but in all the world: Nowe Dobra. We could definitely understand why. There was a lot of love and kindness stored up in these two precious extended families. We were so grateful that they welcomed us into their summer holiday like family. They drove us to the train station and put us on the train with more food than we could possibly eat on our journey home. Ben and I were completely overwhelmed by their kindness. Which of course, will go down as one of the most precious moments of my life. I’m so thankful we made the trip, even the overnight bus.